Growing up, she constantly reminded my siblings and I to have a sense of gratitude for everything around us. No matter where we were in our lives; be it emotional, financial, or mental, my mom would always respond with one word and one word only, ‘Hamdellah (defined as Thank God).’ If I was to criticize how I looked (trust me I did a lot of that back in the day), I would get, ‘Mama you are beautiful. Say Hamdellah.’ But in my mind all I heard was, ‘Beauty is in the eye of the beholder.’ She is my mom after all, right guys? In brief, she always reminded us that no matter what you had to complain about, others have it much worse. REMEMBER THAT. REMEMBER THEM. Beyond words, this ideology has been echoed in her actions. Extra change was always put aside for the needy. Items not worn, by default, were donated as it is not acceptable to indulge while others suffer. Food was not to be thrown away, if it wasn’t going to feed our mouths, it would feed others. Being a compassionate soul, many would spill their hearts out to her (sometimes even before first names have been exchanged – you would be surprised)! Leading to that first story that prompted a domino effect. One day a woman suffering from cancer confided in my mom about how difficult it has been for her to gather enough money to start her treatment. Whilst sick, she would work overtime in hopes of saving money (keep in mind, in countries like Lebanon there is a shortage of medical governmental support). My mom just couldn’t sit aside. Without thinking twice or shying away, she approached family, friends, and acquaintances and got enough money for chemo. Each small deed rewarded itself with another. As CS Lewis once said, ‘if you do one good deed your reward usually is to be set to do another, harder and better one.’ People now heard about my mom’s helping hand and began to call for aid. She patiently listens to their stories, asks for their medical files, advises them, sets medical appointments for them, gathers their costs and supports them fully. 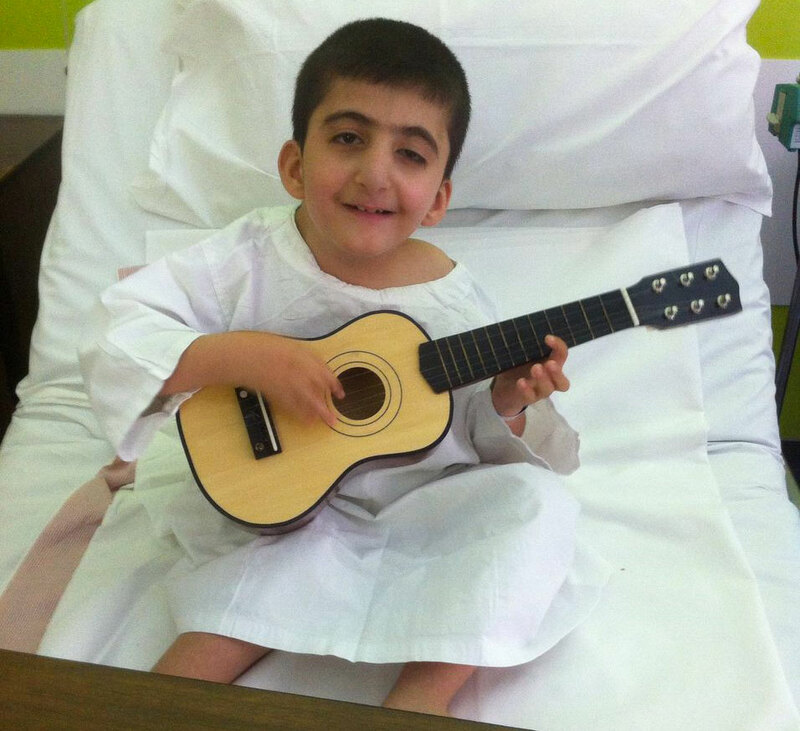 Meet Haidar (pictured). We met Haidar, an only child, when he was just five years old. His parents struggled for twelve years to conceive him and prior to being born, the doctors had advised the parents to consider termination as he suffered from congenital birth defects. He not only couldn’t sit on his own due to his Spina Bfida, but has webs across every flexion crease in his extremities a syndrome known as Escobar. His first operation was three years back and for a long time he could only support himself to sit whilst wearing a corset. 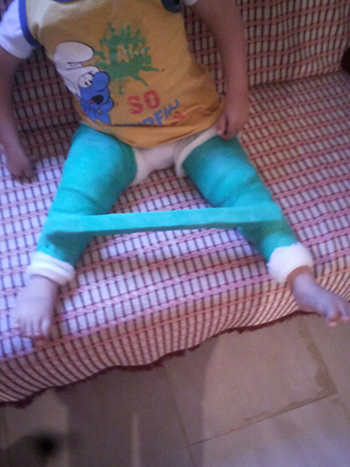 Today, I am very happy to report that after undergoing a lot of physiotherapy and countless surgeries, Haidar can sit up by himself. This little boy has now begun the necessary medical journey to tackle his legs. A few months ago, he underwent hours of surgery and now both his legs are fully casted yet I cannot begin to explain the positive light he shines! Through all the pain, he never complains nor nags. His mental intelligence is beyond his years. Although his physical stance is that of a toddler, his capacity for learning, reasoning, and understanding is that of a young man. Hearing him talk and say gratitude after all he has been through, makes even the coldest of hearts shed a tear or two. His positive outlook, strength, and determination to just become independent and healthy is a message to the world. It’s the simple gifts that we tend to overlook and forget. I just realized that I have so much more I want to share but after Microsoft Corp’s study reported that people now generally lose concentration after eight seconds due to an increasingly digitalized lifestyle, I decided to have a part two for this blog. Stay tuned and don’t forget to count your blessings today and everyday. Today, I am grateful for being healthy, having a loving family, supportive friends and a mom that has taught me to say, ‘Hamdellah.’ What are the things in your life that you feel you should be thankful for today?